The Far Cry series prides itself on freedom of approach – the ability to assess a situation, weigh your options and decide, ‘Yes, I’m going to ride an elephant into that military base’. But its stories have always been linear – told to you in chunks in the fashion of GTA. Read more: the best PC sandbox games. 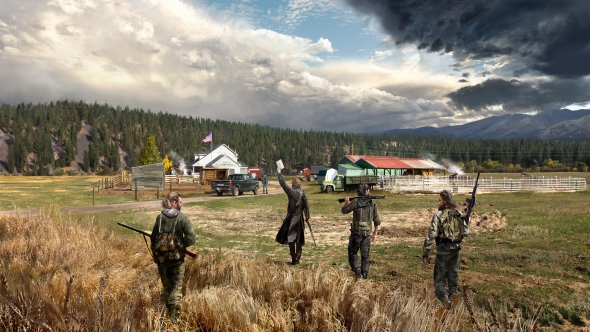 When you start Far Cry 5, you will have one very specific moment with the Father, the game’s radical preacher villain. And, from then on, you pick the order of events. But if you headed north, your first ten hours with the game would be utterly different – coloured by different animals, different people, different segments of story. “It’s designed so that you author your own story,” Hay finishes. Here’s everything we know about Far Cry 5, which comes out on the far-too-distant February 27th, 2018.